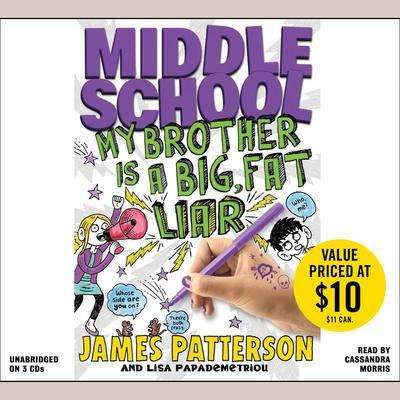 From blockbuster author James Patterson comes the third installment in the #1 New York Times bestselling Middle School series! Georgia Khatchadorian--the sister of the star of the first two Middle School books, Rafe Khatchadorian--plans to excel at Hills Village Middle School in all the places her troublemaking brother failed. She's even bet him that she'll quickly become one of the most popular girls in school. But Rafe left a big mark at HVMS, and no one will give Georgia a chance! Even worse, Rafe has sneakily set her up to embarrass herself in front of the snooty "Princesses" who run the school and the boy who's caught her eye. Will she be able to overcome her fears and win her bet with Rafe? Find out THE TRUTH about Rafe Khatchadorian's sister in the first Middle School story from the point of view of the hilarious Georgia--a girl who's ready to speak her mind!